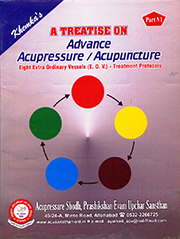 A Treatise on Advance Book Part -06 This is the sixth book of the 24-part epical Treatise series of books on acupressure/acupuncture written by the authors. In Chinese acupuncture, there are eight additional meridians known as extra ordinary vessels in addition to the main 14 meridians. These meridians/vessels are in fact reservoirs of energy, which the main 14 meridians draw upon as and when required. These extra ordinary meridians have eight points associated with them and are of great significance in treatment of ailments occurring in any part of the body. These extra ordinary meridians and their associated points are lucidly explained in this book. Further, the book contains a large number of proven protocols for the treatment of a very large number of diseases. All that one has to do is to look up under the relevant disease section of the book and simply apply the given protocol. The book makes acupressure treatment so very simple for even a novice therapist.